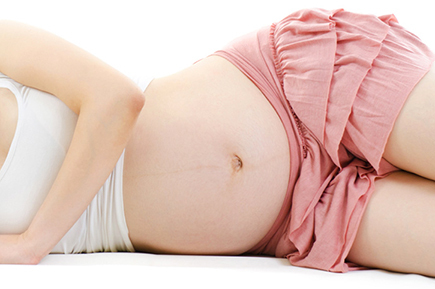 The idea sound appealing, because the concept is to use the cesarean incision to perform the abdominoplasty in one go. Nevertheless, our experience with combining a ceasarean with abdominoplasty in the same session is slightly controversial. It may be done, but the rates of certain complications are , although not uniformly confirmed in scientific literature, slightly raised. We do routinely use laser scalpel dissection technique in abdominoplasty surgery which improves scar quality and makes the procedure less traumatic. Laser dissection does also reduce blood loss during the procedure and therewith makes abdominoplasty surgery safer. For certain patients with very large birth weightsthe combionation is still be an option, because their muscle distension seems to be quite extensive. On the other hand, scientific literature clearly opines that there is no higher incidence of grave complication such as deep-vein thrombosis when perfoming an abdominoplasty together with a cesarean section. Whether to the tummy tuck together with the cesarean section or not is something that I indivisually discuss with my cooperating gyneoclogist depending on each individual case. It is, and will remain a controversial topic in the future, and best restricted to patients who have finished their family planning. Classical abdominoplasty complications, especially seroma, are definitely raised in comparison to sole abdominoplasty. We do noy have a clear protocol neither approving or disregarding this procedure, but decide case dependent together with our cooperating gynecologists.